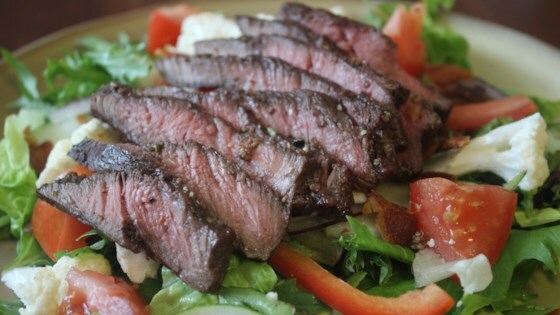 "This recipe was created from a combination of different recipes that I read when I was looking for the perfect iron steak. I combined, adjusted, and finally perfected it to my taste. I'm sure you will love it as well. After all it is perfection." Place the steak inside of a large resealable bag. In a small bowl, stir together the olive oil, garlic, parsley, rosemary, chives, Cabernet, salt, pepper and mustard powder. Pour over the steak in the bag. Press out as much air as you can and seal the bag. Marinate in the refrigerator for 2 to 3 hours. Heat a nonstick skillet over medium-high heat. Fry the steak in the hot skillet for 3 to 4 minutes on each side, or to your desired degree of doneness. Discard the marinade. These steaks taste best at medium rare. Allow them to rest for about 5 minutes before serving. Very good recipie just the way it is. I sauted some mushrooms and made mashed potatoes to go with the steaks and it was wonderful!